In my childhood, I still remember my mother used to make raw noodles with handy machines. So this is my most favorite dish from a long time ago. 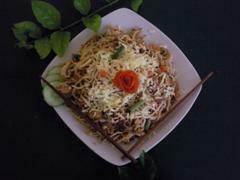 My mother used to try numerous recipes to prepare Asian noodles and other dishes also so this recipe is from my mother who is no more in this world now. I myself, always try different recipes of preparing noodles by discussing with my friends, watching cooking shows, reading cookbooks as well as from my personal experience, as cooking is my passion . I am 100 percent sure that this recipe is a successful one. I hope you enjoy! 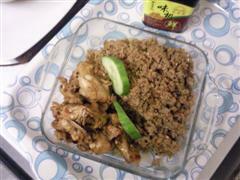 First, boil the chicken with light crushed red chilies and salt, then add cooking oil, onion and green chilies to it. Mix them with boiled chicken and let them to cook for five minutes. chilies to it. Mix them to mince meat and let them to cook for five minutes. Third, put 3-4 tablespoons of cooking oil in a pot and add all cut vegetables, mixing them altogether, adding black pepper, soya sauce and salt and let them cook for 3-4 minutes on light flame. 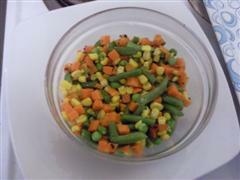 Fourth, fill ¾ water in a standard sized pot with 3-4 tablespoons cooking oil and 1 tablespoon salt and boil the water. When water starts boiling add noodles to the water and let them boil for 10- 12 minutes. Then rinse the water by pouring noodles into a strainer. Fifth, put 3-4 tablespoons of cooking oil into the emptied pot, add 1 tablespoon of crushed garlic and pour the boiled noodles into the pot by adding 2 tablespoons chili sauce, 2 tablespoons tomato sauce, 1 tablespoon mustard, salt to your taste and one teaspoon black pepper. Mix all ingredients thoroughly with big forks and let them cook on a medium flame for five minutes. Now add all cut vegetable, chicken, boiled mince to the pot, by mixing them gently and smoothly. It will take hardly 10 - 15 minutes to do the process. Our dish is ready to serve. 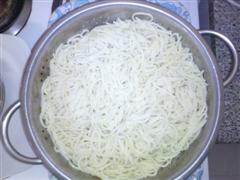 Pour the cooked noodles into a serving dish, decorate the top with grated cheese and pieces of cucumber. I tried this recipe today and it proved to be the yummiest one!!!!wow!!! THIESE NOODLES LOOK TASTY, THOUGH I HAVEN"T TRIED THEM YET BUT THE WAY IT HAS BEEN DESCRIBED LOOKS LIKE IT WILL BE THE TASTIEST ONE. I LIKE ASIAN FOOD VERY MUCH AND ONCE IN A WEEK I DEFINITELY EAT NOODLES EITHER BY COOKING MYSELF OR GO TO CHINESE RESTAURANT. I HAVE A VERY GOOD TASTE FOR CHINESE FOODS ESPECIALLY FOR NOODLES.